When the Trojans held their first full team practice last Friday, new head coach Andy Enfield told the media that he was going to take everything step by step, and go slow as the Trojans learned his system. Now with the first week of practices done, Enfield said he’s thrilled with the progress the team has made thus far. The team spent Friday’s roughly two-and-a-half-hour practice reviewing the defensive and offensive concepts that they have learned so far in preparation for the first scrimmage of the fall. 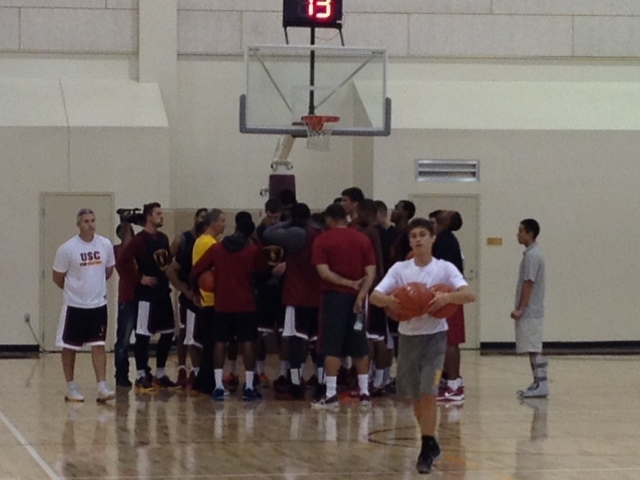 Saturday’s intrasquad scrimmage will be the first time this Trojans team will play together in a game situation. Enfield won’t be coaching in the game however, as the assistant coaches will be leading both sides. The Trojans huddle up after their final practice before tomorrows scrimmage. For the players, tomorrow is the first chance they have to showcase the improvements they have made over the summer. Sophomore forward Strahinja Gavrilovic is looking forward to the opportunity. 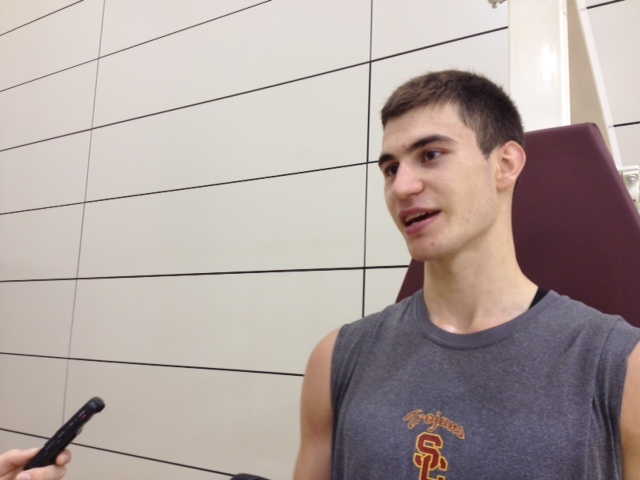 Gavrilovic put on ten pounds of muscle over the offseason, and said that he worked on his outside shot in order to become a viable option as a stretch forward for USC this year. While Gavrilovic will get the opportunity to play tomorrow, two Trojans will be sidelined with injuries. According to Enfield, center D.J. Haley and freshman guard Kahlil Dukes will both be sidelined. Haley has a sprained neck, and won’t be cleared for full practice until at least October 16, when he sees the doctor again. Dukes is slowed with a strained left hamstring. Both of those injuries occurred recently, and both players have missed the last couple days of practice. Despite the injury to Dukes, Enfield said he’s been happy with the progress that the freshman have made so far. The Trojans have six freshmen on the 17-man roster, and according to Enfield they have done well so far adapting to the college game. Following tomorrow’s scrimmage, the Trojans will have five weeks until their first game on November 8th at Utah State. With the first game a little over a month away, the Trojans will continue to learn the important parts of Enfield’s offensive and defensive systems. Next week’s practices will be focused on zone defense and a couple of presses, as well as some new offensive sets. For Enfield, this new week of practices is another opportunity for the team to come together in the run up to the 2013-2014 season.